With higher education fees rising- books, tutition, students fees, etc – free or reduced cost books can be invaluable to those struggling to pay the bills. Recently I found a student-run site called Textbook Revolution, that focuses on finding free educational materials. More and more of these grassroots efforts are springing up online and offering alternate ways to obtain content. To continue reading please go to the article by Steve Kolowich, which appeared in the February 22 issue of Inside Higher Ed. The TLP website comprises our Knowledge Base about all our supported technologies and services, workshop descriptions and registrations, the TLP blog, our Diigo social bookmarks, and many links to the pedagogy and technology service groups across our campus which serve our faculty. 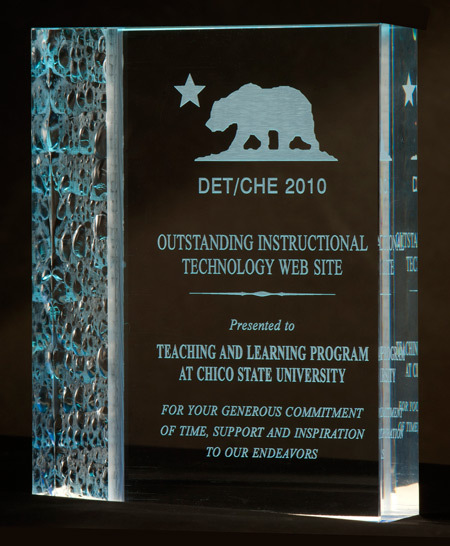 We’re pleased that Kathy Fernandes, director of Academic Technologies (ATEC), of which TLP is one part, was present to accept the award and to bring it home. As previously announced, we’re excited to be replacing Vista with Blackboard Learn 9.1. Faculty are invited to attend one of our informational meetings to find out how a team of faculty and staff evaluators selected Blackboard Learn 9.1; see a preview of the new teaching and learning features that Learn will deliver; and hear about the planned timeline for course migration. Faculty may attend either Thursday, February 24 from 10-11:00 a.m. or Friday, February 25 from 12-1:00 p.m. Both sessions will be held in the basement of Meriam Library, Studio A. Refreshments will be served. For more information, please contact Laura Sederberg. Full Source Text — covered in the video above… the ability to see *all* of the text of a matching source, and to navigate across matches for that source. PeerMark Layer — covered in the video above… instructors and student authors can now view PeerMark reviews within the document viewer, as a layer onto the original paper. * Work with a single, “all-in-one” view of a student’s paper in its original format, including styled text, graphics and photos. * Save time and increase productivity with improved tools and a unified user interface. * View feedback from all sources in one comprehensive, multi-layered view. * Maintain academic integrity and engage students in their development as learners. No pre-registration is needed, simply click on the appropriate link at the starting time, to enter the webinar. If you have any problems, please email tiisupport@turnitin.com.